In her latest project, Ghanaian-British photographer Heather Agyepongreimagines Sarah Forbes Bonetta’s complex legacy through a contemporary lens. And, exactly who is Sarah Forbes Bonetta? That’s the question I asked myself after reviewing Agyepong’s sepia-toned portrait series. At the time of publication, a quick Google search of the name yields 200-plus search results. Most of the article titles simply allude to Bonetta’s being a little-known figure in Victorian history. The more conspicuous of the bunch pigeonhole her as an “African Princess,” making sure to mention her even lesser-known relationship to Queen Victoria. “You’ll Never Guess Who This Woman’s Godmother Was,” reads a Buzzfeed article. Yes, Sarah Forbes Bonetta was a member of the South-West Nigerian clan formerly known as Egbado Omoba and born into royal blood. And, yes, Queen Victoria was her godmother. But, Bonetta was also orphaned at age eight following the slavery-related massacre of her family, and promptly given to a British naval officer. She was promptly renamed and presented to the Queen as a gift. She was publicly praised for her exceptionally high intelligence and musical aptitude, often in comparison to her young predominantly white peers. She was coerced into marrying a Yoruba business man 14 years her senior, with whom she had three children before dying of tuberculosis in 1880. Bonetta has since become a historical figure whose convoluted life story casts harrowing shadows and sheds critical light on the varied experiences of Blacks living in Victorian times. 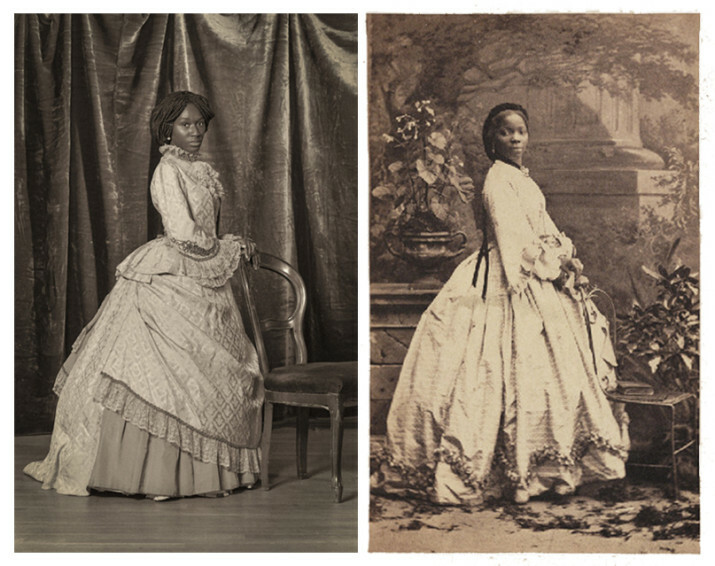 That’s why Agyepong felt compelled to center her archive research project Too Many Blackamoors on a small sepia-toned photograph taken of Bonetta during her London honeymoon.